Is traditional metaphysics opposed to the scientific theory of evolution? Traditional metaphysics is not necessarily opposed to every version of the "scientific theory of evolution". What it is opposed to (and what "science" itself should be opposed to) is the popular mythology built up around the theory and disseminated by schools and the mass-media. Actually there are many versions of the "scientific" theory and they are frequently changing: so the popular notion that there is a single, established "theory of evolution" is actually part of the myth. In her seminal book The Feminine Universe, Miss Alice Lucy Trent explains that the Theory of Evolution, in its popularized, semi-scientific form, constitutes a pseudomythos – a story-picture which falsely replaces traditional myth as the fundamental story of "how things are". Myth is fundamental to how we understand the world, and replacing genuine Myth (which is metaphysical in origin and refers to the underlying. supra-physical Truths of manifestation) with a literalistic pseudomythos, operating on a purely physical level, impoverishes our perception of the universe we inhabit and reduces it to a two-dimensional caricature. From a rich reality operating on every level of being, it becomes a purely physical mechanism in which everything has (to use one of the clichés of the new world-view) a "natural explanation". Professor C. S. Lewis chose his inaugural lecture as Professor of Mediaeval and Renaissance Literature at Cambridge University to put forward his demonstration that between the early and late nineteenth century – between the time of Jane Austen and that of the young T. S. Eliot – there lay a breach deeper and more radical than that between the time of Jane Austen and that of Beowulf. Something happened to Western culture during the nineteenth century that set Western culture apart from the entire stream of human culture going back to the earliest patriarchal times. What was that "something"? It was not the Industrial Revolution or the Scientific Revolution – they had already taken place before this Great Shift that Professor Lewis demonstrates. Miss Trent shows that this shift takes place around the popularization of the theory of evolution and its adoption as a pseudo-mythology. Our Myths – our fundamental stories-of-origin – are what make us what we are, and when we replace the revealed Myths of traditional culture with a pseudo-mythology of human creation, we radically distort our culture. Let us stress again that all this has little to do with whether the actual scientific postulates of biological development are correct. It has more to do with their adoption on a popular level as a replacement for traditional Mythology. The fact that popular evolutionism is a pseudomythos may easily be confirmed by looking at the comments on YouTube or Amazon Books concerning any presentation of a case against the theory of evolution. Non-specialists will immediately respond (often without having read the book in question) with impassioned attacks on any perceived threat to the Beloved Theory. Now, if a book or video were to question other fundamental scientific theories – such as relativity or the laws of thermodynamics – few if any non-scientists would have an emotional or impassioned reaction. The reaction in the case of evolutionism is motivated by a displaced "religious" impulse. People are alarmed and frightened by the questioning of the basis of their understanding of the world – of their myth-structure – and thus react with ridicule and anger. 1. 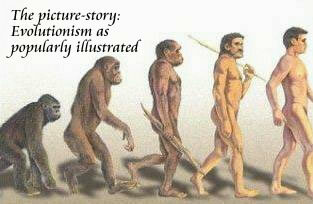 Evolutionism replaces, for most modern Western people, traditional mythic accounts of the nature of being. 2. It attracts the same sort of emotional commitment that religions and other mythic accounts inspire in their followers and engenders the same anger and insecurity when it is threatened. 3. Since it operates on a purely physical level, it leaves unanswered and unsatisfied many of the dimensions of meaning addressed by authentic Myths. In the following parts of this enquiry we shall look at the nature of true Myth and the nature of the pseudomythos of evolutionism. We shall see how Christian fundamentalism fails to address the most important aspects of this question, and indeed, with its simplistic creationist critique, is, in some respects, the evolution-myth's best friend. All written material at the Chapel of Our Mother God is copyright. Should you wish to reproduce any portion please contact us for permission. Would Jesus Believe in Evolution? The Gospel of Our Mother God is a collection of inspirational texts, prayers and daily inspiration for the Mother-Faith devotee or household. Everything you have ever heard comes out of the patriarchal world-view. Its materialism, its religion, even its feminism. Here is the other way of seeing the world; the natural way: the way that everyone saw things before patriarchy and will again when patriarchy is long forgotten.